Back in Melbourne James and I used to spend CNY with my extended family – we would play mahjong and then go out for an overpriced Chinese banquet (which Howie says is a rookie mistake – his family used to own a Chinese restaurant and he says it’s the worst day of the year to go). We were invited to a CNY celebration in the International District but already had plans to go snowboarding that day. 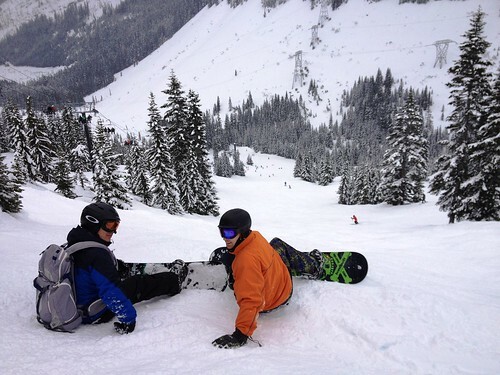 Here are Mike and James on the back side of Stevens Pass. You have to take a few chairlifts to get there but it’s less crowded than the front side and the blues are steeper and longer. After doing the blues on the back side all morning, James and I summoned enough courage to try a couple of short blacks on the front side. One of them was easier than the blues and the other was terrifying to look down (I’ll get a photo next time) but once I realised that I could point my board down and not die, it was fun! We have plans to go to Crystal this Friday with Chuck and Caroline, and hopefully again on Saturday with our regular snowboarding group to a yet-to-be-determined mountain. Easy access to the snow is one of the best things about living in Seattle. Oh that reminds me, you know how in Australia we say “going to the snow”? That’s not a phrase here. Apparently it sounds weird to them, like saying “I’m going to the road”. James also informed me that Americans also don’t say “keen on” to mean “interested in”, as in “I’m quite keen on fishing this weekend”. He said there were some new guys at work who didn’t understand some of his phrases and it turns out his colleagues have just been pretending to understand him because they were all like “yeah actually we have no idea what you’re saying either”. Poor James; he thought he was communicating but all this time people have just been nodding and smiling. 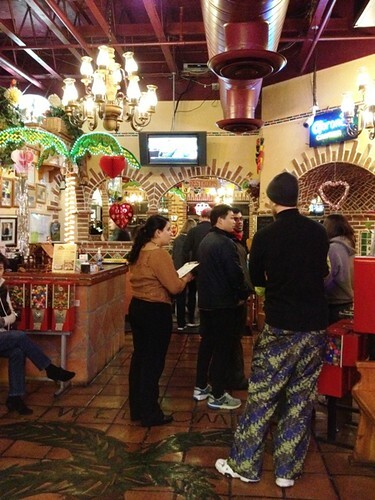 But anyway, after our day of snowboarding we had dinner at a Mexican restaurant called La Palmera. It was located in what seemed to be an office building, which was weird, but once you got inside it was like any other restaurant. 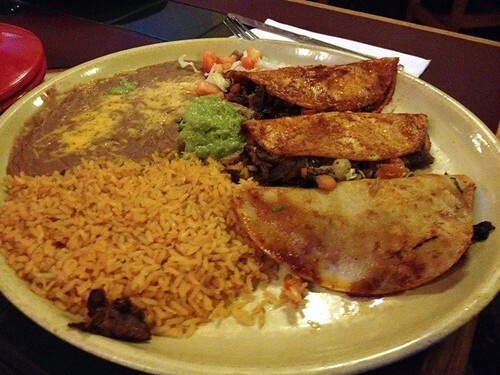 Do you know what I love about Mexican restaurants? Free chips and salsa! On the menu they said that they would charge for refills but they automatically refilled our chips while we waited and didn’t charge us. James and I both ordered the jumbo margaritas. They were so full that I had trouble lifting them with one hand when we toasted to the (Chinese) new year. 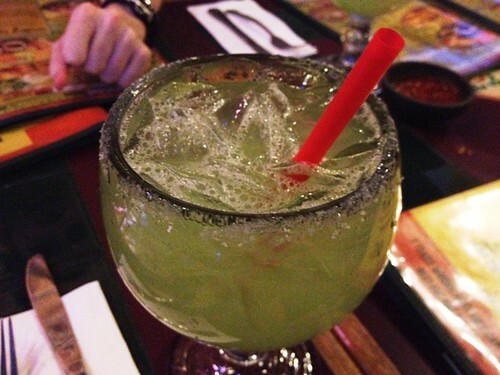 But aside from their hugeness the margaritas weren’t anything special. 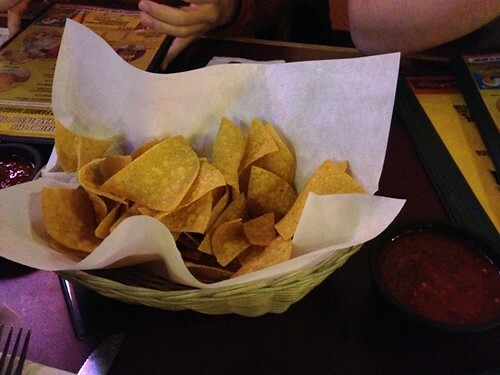 The food portions were pretty big – although maybe they only seemed big because I was already stuffed full of chips. 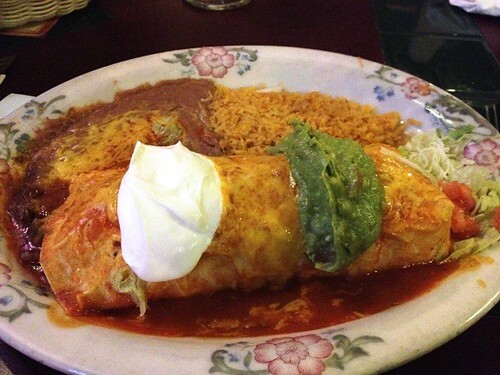 I ordered a carnitas burrito. Again it wasn’t anything to write home about. It was enormous though, so I got about 2/3 of the way through before I was stuffed. James got tacos al carbon. You can see his napkin in the back to get a sense of how big the plate was. James finished his margarita pretty quickly and ordered what I think was called a coronita (a corona margarita). Yes it looks exactly how you would imagine. 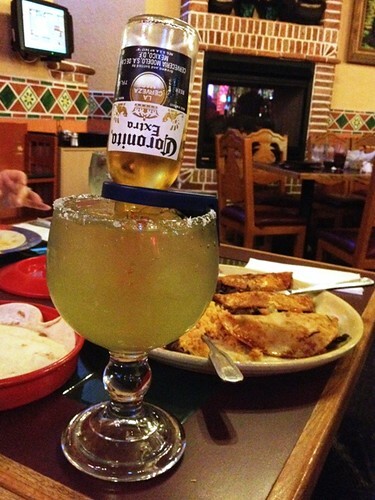 He said it was absolutely foul; the only OK part was the beginning which was mainly margarita and as the corona gradually mixed in it got gross. He was glad he tried it though, cos he said that he would have always wondered. Because of all the booze the meal ended up being really expensive! After tip it was something like $75 for the two of us, which is one of the most expensive meals we’ve had since we got here, and massively expensive for Mexican food. There are heaps of other Mexican restaurants where I’ve been really happy with the food for half the price. So we ended up paying heaps for a fairly average meal. Boo! But at least we were full (stuffed, even) and the food came out fast. My cousins told me that for their CNY meal they didn’t order enough (6 banquet meals plus 2 dishes for a 10 person table – noobs!) and it took awhile to arrive so everyone was still hungry afterwards. Plus they paid more (and didn’t get alcohol) so I guess all in all we made out alright.